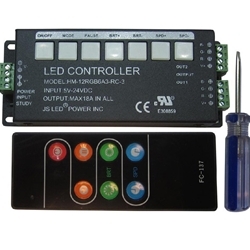 JS LED Multifunction Controller is a high-end controller that features a modern, sleek appearance. These control panels are specially used for controlling a variety of LED Lighting. Easy to connect, easy to use features such as jumpy changing, gradual changing, strobe, flash as well as other modes.
? Use wireless remote control in 30 meters, or control by the keys on the controller panel.
? Three Channels RGB control . Constant voltage driver ,Max 6A each channel.
? Up to 31 changing models to select , 256 grey level changing.
? Each model can select changing speed and overall brightness separately.
? 8 Level brightness and speed adjustment.
? Change and Pause function.
? Mode , Suspend protection ,memory function.